The first known German broadsheet announcing the executions of Serbs due to railway sabotage is dated June 12, 1942. On that day, the Germans shot three rail workers in Smederevo, claiming they had destroyed the brakes on a train. Gen. Mihailovic knew that America would join the war, having heard it from President Roosevelt’s envoy William Donovan during his visit to Belgrade. German Transport for Africa: Chetniks blew up this transport near Demir Kapiya (present day FYR Macedonia) on December 27th 1942. ”That is why Gen. Mihailovich organized a network of saboteurs not just in Serbia, but in Hungary, Romania and Bulgaria, to disrupt railway traffic headed for Africa and the Eastern Front. Col. McDowell found out about this in the summer of 1942, not just from the Mediterranean intelligence HQ, but from Jewish organizations involved in smuggling Jews out of occupied Europe ”, said Colonel Dragan Krsmanovic. The bridge at railroad Belgrade – Thesalloninki near Vranjski Priboy, in Southern Serbia- Chetniks blew up this bridge at night between March 17th and 18th 1943. Col. McDowell writes that Gen. Mihailovich launched the railway operations on his own. We know today that the British first asked for special attention to railroads in July 1942. After that, they made more requests, gave recognition, and made promises. As recognition, the White House asked King Petar and Gen. Mihailovich to send a message to the American people and the U.S. military, to be broadcast at a specific date on all U.S. radio stations worldwide. 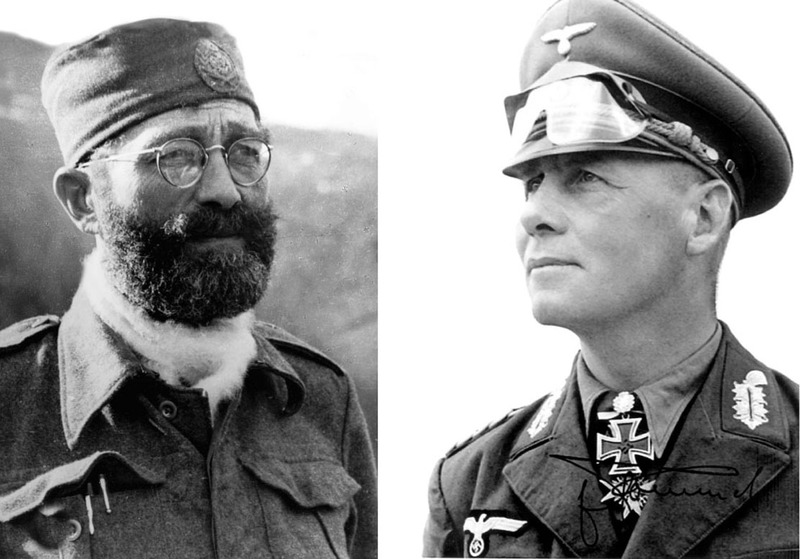 All the American radio stations carried the message from Gen. Mihailovich and King Petar on November 1, 1942. Here was a poster the Germans put up throughout Serbia in 1942. German poster (1942): a cartoon with the character of General Mihailovic. The written message: “Long Live Serbia!” His followers with the hellish rant of ‘Long Live Serbia’ demolish railroads and bridges, schools and churches, killing county and state officials”. It shows a caricature of Gen. Mihailovic under a mined bridge being crossed by a train. Underneath, it says his men are also demolishing schools and churches, which was of course not true. According to the Germans, “Gordon” performed an incredible 1499 acts of diversion and sabotage. It is the biggest documented tally of any sabotage unit in WW2. And those are just the ones the Germans knew about. According to the report (November 29, 1942) of the German Commander of the Balkans, General Alexander Lohr, the Germans built in Serbia 177 “guard towers” – bunkers near railroads and “other important facilities” and another 64 were under construction. “Zbornik dokumenata” [Collection of Documents], Beograd 1976, volume 12, book 2, pp. 900). Many of them are preserved to the present day as this one in front of a tunnel near Kraljevo in Serbia. The Germans finally destroyed “Group Gordon” in the summer of 1943. They caught 773 suspected members, and executed 396 after interrogation. 207 of the detained were sent to hard labor, 120 were released for lack of evidence, and 50 were kept for further interrogation. During their missions, 35 members of “Gordon” had died fighting or in demolition-related accidents. “Whoever comes close to the railroad, will be shot dead” – typical sign near railroads in Serbia during the war. ”Everything is at stake in this struggle. There is no middle way. To consider this heroism of a freedom-loving people is inappropriate.”Serbia is soon covered in posters listing the names of executed Mihailovich supporters. Some 70,000 Serbs were executed or killed in German punishment expeditions. Most of these Serbs were considered Mihailovich supporters. were executed on December 26th 1942. This is the result of the rebellious activity of DRAZHA MIHAILOVIC. ”We know the Western allies broke all their promises from 1942. In the many books and movies devoted to operations in the Western Desert, not a single one mentions the role of Gen. Mihailovich and his men in winning the Battle for Africa”, said Colonel Dragan Krsmanovic. of course like your website however you need to take a look at the spelling on quite a few of your posts. Many of them are rife with spelling issues and I in finding it very bothersome to inform the truth then again I’ll definitely come back again.